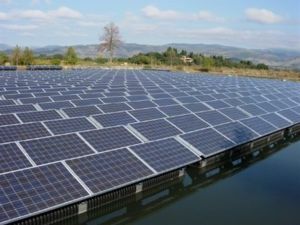 The Far Niente winery in California's Napa Valley has a photovoltaic installation of around 2,300 Sharp solar panels which generates 400 kWs at peak output. The array was developed by Thompson Technology Industries and installed by SPG Solar. Power produced from the array "significantly offsets the winery's annual power usage and provides a net-zero energy bill." This page was last modified 16:18, 26 July 2008.